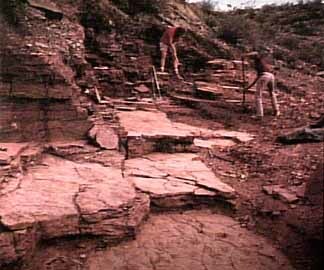 Jerry MacDonald has discovered some of the best Paleozoic trackways in the world in the Robledo Mountains of New Mexico. Pictured here with the track of a Pelycosaur, Jerry endured the desert heat and various political hurdles in his quest to unlock the mysteries of animals that roamed the earth long before the dinosaurs. 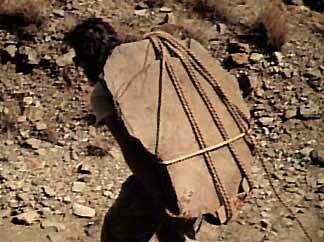 Jerry hauled out tons of rock in his efforts to share his discovery. The animals who made the tracks lived over 280 million years ago, making these some of the earliest footprints known. Jerry realized that if whole trackways could be found, the amount of knowledge to be gained would far surpass that from single tracks alone. He began to concentrate his search in redbeds. He spent untold hours over a period of several years before he finally unearthed the trackway motherlode of the century. When major trackways had been uncovered, the process of measurement and interpretation begins. 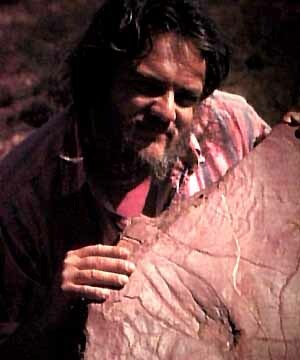 Jerry founded the Paleozoic Trackways Project, a research initiative including the Smithsonian, Carnegie, and Los Angeles County natural history museums. 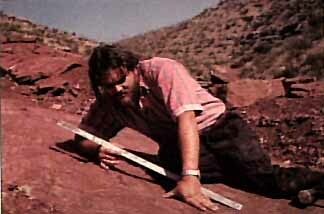 His discoveries have been featured in National Geographic and Smithsonian magazines. He has written a book about his discoveries and expoits in the Robledo backcountry entitled "Earth's First Steps", available from our giftshop.